If you are a new owner of a DSLR, knowing everything you should have with you or what you may need come be overwhelming. 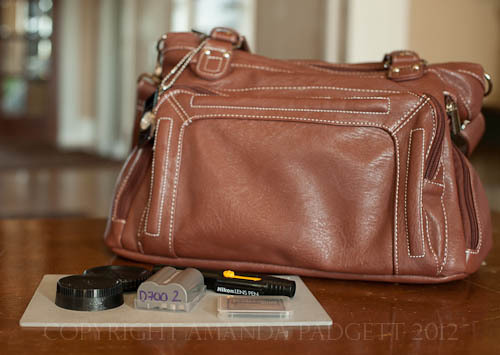 Here are some things that always stay in my camera bag. It will happen eventually, a time when you have forgotten to charge your battery and then you get to an important event and you look down to see you have one bar left on the battery. Buy, charge and keep an extra battery in your bag and you will save yourself these “I should have known better” moments. A little trick I do is label my batteries on the ends, so that I know one from the other. And, if battery starts to not hold a charge, it is easier for me to identify and replace. An extra memory card is a vital thing to keep in your bag because you may forget to upload your pictures from a previous event and when you get to your location, be it a birthday party or the Biltmore Estate, you will cry when you can only take 10 pictures because the space on your card is full. Having an extra memory card will keep that potential disaster from happening. This is one I’m sure you weren’t expecting. But, if you are at all like me, situations will arise when you end up needing an end cap to a lens or a body cap for your camera. I’m not saying they are often, but they do happen. And, those are items that when you need them, you really need them. I ordered extras from B&H Photo so I can keep spares on my camera gear shelf and put the others in my camera bag. You have this high dollar camera, you have worked hard to learn how to use it and then you forget to clean the lens and end up with dirt or smudges on it, which show through on your pictures. That can be such a hard pill to swallow! Get a good lens cleaning cloth, or like me use a Lens Pen, and get in the habit of looking at your lens each time you take the cap off. This little 2 second step will save you so much time later in post processing. Yes, I know you may be new to photography, but after you learn how to shoot in manual, I suggest trying to learn how to custom white balance. It may take you a minute or two to stop and do it, but will save you so much time and stress later. I previously used a gray card, but just recently purchased an Expo Disc and I am quite pleased with it. I bought the 72mm so that I can use it for all my lenses. Gray cards come in all shapes and sizes. Do some research, ask your friends, ask on favorite photography Facebook pages, ask for recommendations. Just buy one and learn how to use it. Are these items you already have in your bag? What else do you keep in your camera bag at all times?